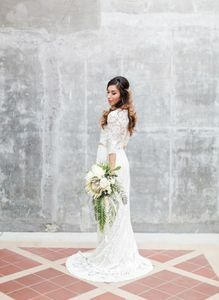 The exposed brick and wood beams at the Howl Event Space in Long Beach, CA were the backdrop for this next stunning editorial. 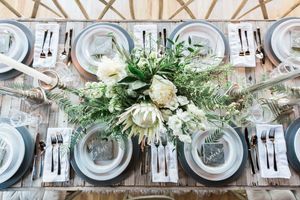 Danielle Mitchell Events and Brian LaBrada Photography teamed to bring this nature inspired shoot together using organic elements of wood, slate and some of prettiest proteas we've seen! 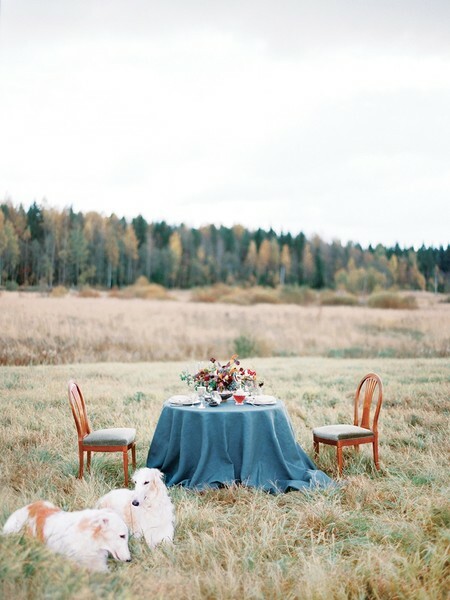 We styled this editorial with the intent of having an organic, relaxed elegance. It is minimalistic with a classic, neutral color palette of whites, greens, natural wood, and touches of metallic – yet exudes personality with its use of natural materials, including raw wood and slate tiles. 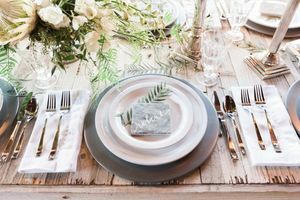 The ceremony items were a chippy, vintage mantel that was recovered from a North Carolina cabin next to old bottles searched out from the East coast & tall Elk antlers that were discovered in the woods of Montana. 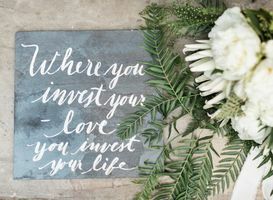 The wooden ceremony benches were crafted by hand and display beautifully next to the authentic Moroccan wedding blankets and warm New Zealand wool flokati rugs. 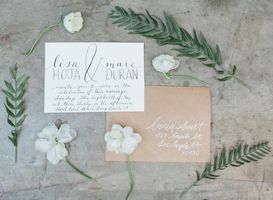 The florals provided by Studio La Fleur for the Earthy Elegance Shoot is a mixture of masculine and feminine elements. The strong structural branches like olive branch intertwined perfectly with the soft blooms of the delphinium. In the dining set up we used six-foot tall pepper berry branches suspended from the ceiling and windows to continue the vibe inside the space. Providing an awesomely perfect amount of earthiness without over taking the structural beauty that already exists in their restored space. For dining, the St. Helena Table is a hand-forged, reclaimed wood farmhouse table with a parquet top & sitting alongside, the Charlotte chair, a simple cross-back wooden chair that works well in any rustic or refined environment. 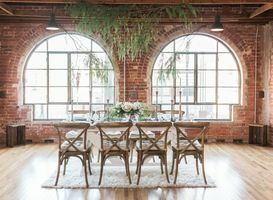 The natural brick walls, exposed wood beams, and amazing original window frames provided by Howl Event Space completed the earthy and elegant atmosphere. We gave the space some life by adding greenery to the ceiling beams and windows, allowing it to become a native extension of the building. All of the vintage furniture was provided by Sweet Salvage Rentals. 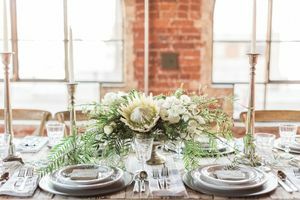 The dessert cart was a rustic wood industrial cart that played beautifully against the unrefined backdrop of the exposed brick. 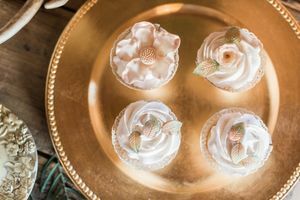 The wedding cake was complimented with buttercream cupcakes in soft hues of color, designed with handmade sugar flowers and leaves, accented with gold and pearl embellishing, lace trim, and vintage decor. 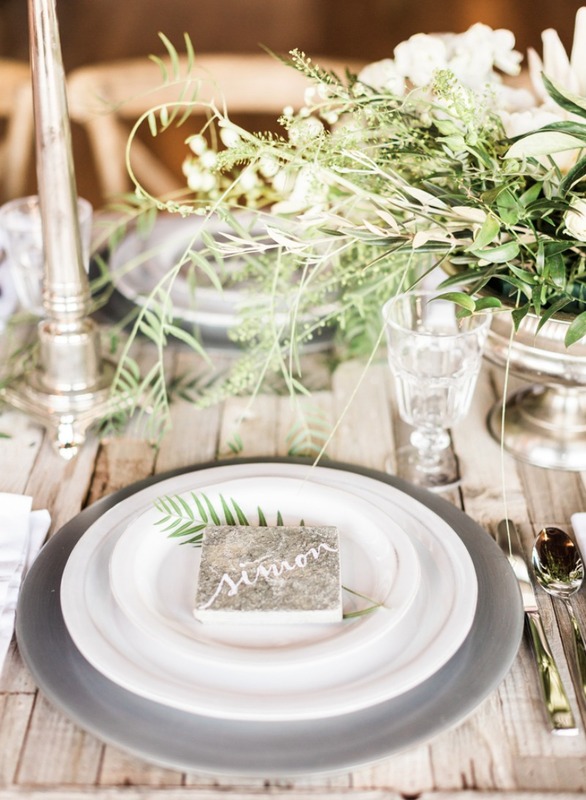 Berries and ferns were provided by Studio La Fleur. 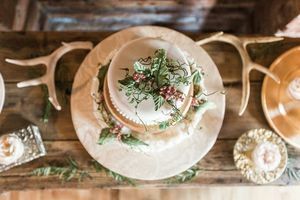 Love Me Sweets created an " Earthy & Elegant" wedding cake with fondant covered ruffles, painted gold luster, pearl trim, hand made sugar leaves with a touch of shimmer!